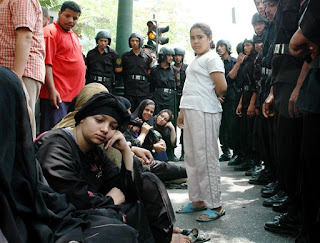 Egypt is so rife with protest these days it’s difficult and crucial to keep track. On any given day, at least one group of citizens takes to the streets to press demands, air grievances, and claim recognition. Sometimes, miraculously, they win. Take the example of the recently concluded strike by al-Azhar schoolteachers to protest their exclusion from the new wage schedule. In a rare display of collective resolve, the teachers refrained from marking thanawiyya exams, refusing to cave in to government threats, empty promises, and protest fatigue. Their brilliantly timed work stoppage in the thick of thanawiyya ‘amma season compelled Hosni Mubarak himself to intervene and decree their inclusion in the new wage structure. But protest by teachers and other professionals is nothing new, going back to 1919 if not earlier. Judges and parliamentary deputies have now also added street action to their tactical repertoire. And protest is the stock-in-trade of students, factory workers, and democracy activists. What’s striking about a recent spate of street action is the leadership of ordinary people. These reflections are prompted by three recent instances of ordinary people’s collective action. First are the Qal’at al-Kabsh residents (above), whose homes were decimated by a conflagration in March. They immediately marched to the gates of parliament in protest, demanding alternative housing and action from their parliamentary deputy, none other than the venal Mr Fathi Sorour. The spectacle of homeless women and children fearlessly occupying prime pavement reserved for high officialdom was extremely threatening. Riot control were despatched to encircle the citizens and forcibly remove them. Second is the collective action by North Sinai residents against years of government neglect, discrimination, and police brutality. In response to police shootings of two Bedouins in April, Sinai denizens took to the streets in protest, staged a two-day sit-in, drew up a list of demands, and threatened an open-ended sit-in if those demands were not met. Third is the spectacular act of protest by Borg al-Borollos villagers on 3 July, when they blockaded the coastal highway in Kafr al-Shaykh for 12 hours to call national attention to their plight: the chronic lack of potable water for weeks and months on end. Residents are forced to purchase jerry cans of water at the scandalous price of £E40 per week, and the purity of this water is dubious since many cans were previously used to transport petrol. Street action by groups of ordinary people isn’t new, but it’s far less documented and celebrated than similar action by workers, tradesmen, students, and other organised social sectors. Unlike these groups, ordinary people rarely distribute pamphlets or carry placards that survive as records of their action. Its sporadic character and focus on basic needs (food, water, housing) is often taken to mean that ordinary people’s protest is somehow less significant, less political than ‘real’ protest. By contrast, the press is currently portraying ordinary peoples’ protests as portending an impending national revolt and regime breakdown. Notwithstanding their excellent coverage, al-Masry al-Youm’s editors have inexplicably christened the water protests in Kafr al-Shaykh, Gharbiyya, Daqahliyya, and Giza as the “Revolt of the Thirsty,” implying that widespread popular wrath will inevitably translate into political upheaval and ‘chaos’. But alternately downplaying and hyping citizen protest is a poor substitute for actually understanding it. There are several remarkable features of recent citizen protest that deserve recognition and more careful attention. First is the fact that there’s protest at all, in more than one locale and concerning more than one issue. What compels ordinary, powerless women and men to take extraordinary risks and confront those who have immeasurably more power and prestige than they? Wrath doesn’t explain it, since that’s ubiquitous and constant. For ordinary people to translate their anger into action is rare and remarkable, not just here but anywhere. It’s even more remarkable given citizens’ experience with the police state’s response to any kind of public assembly. Then there’s how protest is conducted. All three instances of protest involve ordinary people peacefully but assertively taking over public space, space that is obsessively guarded and regulated by the government as markers of its power, ownership, and complete control. 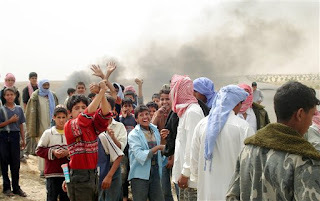 Consider the daring acts: Sinai residents blockading roads by burning tyres (above), Qala’t al-Kabsh women and children planting themselves on the pavement in front of parliament and refusing to budge or leave without a fight, and Borollos folks shutting down traffic for hours on a major highway. Let’s not forget the recent incident of al-Marg residents intercepting a ministerial motorcade to gain an audience with the housing minister about the recurrent problem of sewage flooding their streets. The boldness of these acts should not go unnoticed. These are not the acts of desperate people indiscriminately expressing wrath or engaging in some aimless ‘revolt.’ They’re acts directed at specific targets, seeking specific goals, and couched in specific claims. It doesn’t take a genius to observe that high-ranking government officials are the unmistakeable objects of the recent citizen protests. These afflicted citizens are not beseeching religious figures or other social eminences to intercede on their behalf. They’re not wasting time on municipal government officials, because they know only too well that they’re useless or downright complicit in their plight. And they’re not attributing their problems to general injustice or resigning themselves in the manner of ‘things have always been like this.’ It’s because of the chronic, collective nature of their problems that they’re boldly demanding the involvement of high-ranking government officials. The recent spate of ordinary people’s protest targets specific government officials, includes coherent attributions of blame, advances detailed proposals for solving the problems at issue, and is couched in a clear, crisp language of citizenship rights and entitlements. If it’s true that ordinary people are innovating new ways of dealing with the government, why is this happening? The erosion and near-collapse in the infrastructure of basic services (sewage, potable water, irrigation water) is a key factor, but even more aggravating to citizens is that they’re still required to pay fees for services that they don’t receive. What’s more, the services they’re being deprived of are the very minimum required for human survival. We’re not talking about affordable healthcare, decent schooling, or subsidised alimentary goods, things they’ve long ceased to expect from this government. We’re talking about clean water, for God’s sake! We’re talking about the right not to suffer routine police brutality, as in the case of North Sinai’s residents. We’re talking about the right to have alternative housing when the government decides to “upgrade” the neighbourhood you’ve lived in for 50 years by clearing you out. Another factor that may be causing ordinary people’s street action is the inefficacy of existing representative structures. Ordinary citizens have a long and bitter experience with unresponsive or corrupt municipal officials, so they’ve realised that they must surpass these ineffectual intermediaries and make a beeline for the national symbols and holders of political power. A third factor may be the changing nature of protest itself. Ordinary people may have noticed that street protest is now a common and well-worn method used to advance all manner of collective interests, whether by poultry farmers or unemployed university graduates or citizens opposed to the construction of mobile phone towers or families of disaster victims or congregants after Friday prayers. They see these groups advertising their grievances and they mimic their tactics. That response is very telling. I’m convinced that government officials harbour a deep fear of ordinary people’s collective action; it’s unpredictable and novel and therefore less tractable than street action by students, workers, and professionals, sectors whose protests the government has a long history of managing and defusing. Just this once, the terror-stricken Salama is right: he refused to meet with Borg villagers because they were in no mood to remonstrate, plead, beg, and politely petition, the customary repertoire of action used by the powerless when confronting the powerful. Today, something else is afoot. Ordinary people are engaging in public, collective demand-making targeted at the highest state officials and couched in the unimpeachable language of citizenship and basic human rights. Time will tell if this is a brilliant but ephemeral spark, or a new template for political action in Egypt.